Who would have thought it? 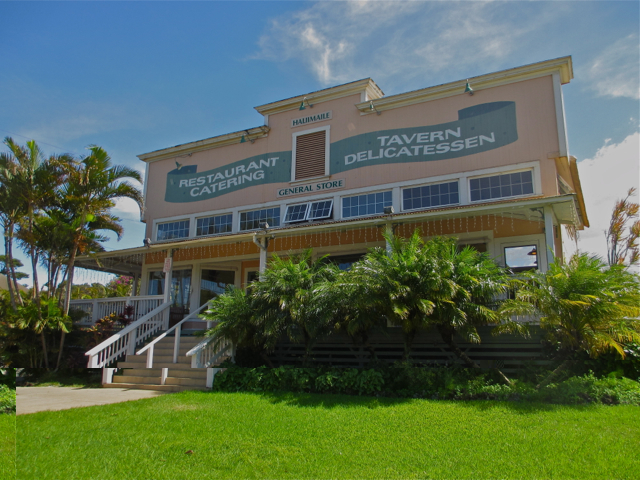 Just off the main road to the volcano, on a street overlooking pineapple fields and the ocean, is a truly excellent fusion restaurant: Hali'imaile General Store. An informal place in a house built in the 1920s as the general store serving a pineapple plantation, this restaurant has been winning awards since it opened 25 years ago. At the suggestion of the concierge at our hotel, we started with the Sashimi Napoleon, constructed of smoked salmon, ahi tartare and ahi sashimi, separated by fried wontons as the pastry element, accompanied by a wonderful wasabi vinaigrette. J followed up with the red veal burger, a perfectly cooked burger with a delicate layer of brie, caramelized onions, local tomatoes and greens and a delightful avocado aioli, accompanied with well-seasoned fries. I had a Cubawaiian sandwich, the restaurant's innovative take on a classic, made with roasted local pork, Black Forest ham, Swiss cheese, pickled pineapple and an excellent wasabi barbecue aioli, also accompanied with their excellent fries. The innovations made sense and both sandwiches were real winners. 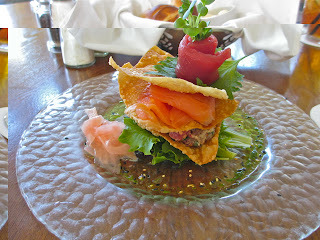 Fusion food is the hallmark of Hawaiian food these days. It can be clichéd, but when devised and executed with care and subtlety, it can be quite wonderful, as it was at Hali'imaile General Store. Today is my last day in Paris, so I went on my final food-gift shopping spree. 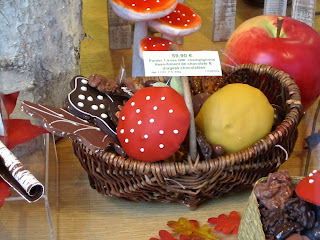 Although I resisted the urge to buy their chocolates, I still loved the autumn windows at Jadis et Gourmande (see my post of June 28, 2012 for more on this chocolatier). I went to the Marché Barbès today for a different take on Paris markets. 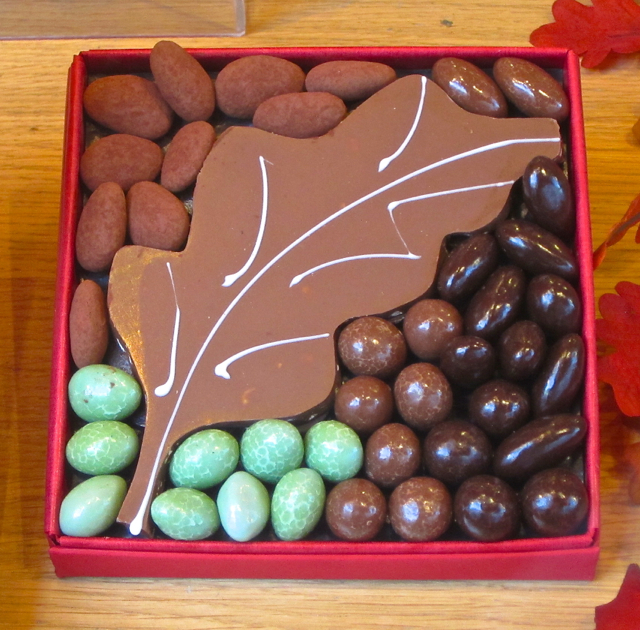 Located in the 18th arrondissement on the boulevard de la Chapelle, under the elevated Métro tracks, extending from the Barbès Rochechouart station halfway to the Porte de la Chapelle station, this is a market for real people. It is incredibly crowded with shoppers, at least on Saturday morning. The produce here is good, although more comes from Spain than in more upscale markets, and incredibly cheap. Like two giant lettuces for one euro, peaches for a kilo per pound, etc. Most of the vendors are North African, as are many of the customers, but shoppers come from all over town. In addition to the produce, there are clothes, hardware and other goods on the outer perimeter of the market area. The market has a bit of the atmosphere of the souk in Marrakesh, although it is a good bit less exotic. Indeed, a guide book said I would find lamb heads roasting on spits, but unfortunately I didn't see any. 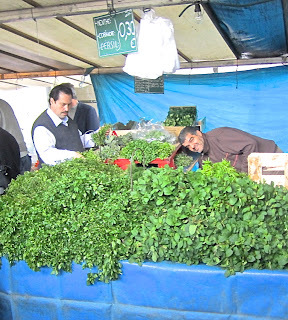 However, I did see copious and appetizing displays of mint, coriander and parsley, which are the herbs most used in North African food (think mint tea).